I get so excited when I’m out to lunch or dinner and I see a special risotto on the menu, and I almost always order it. 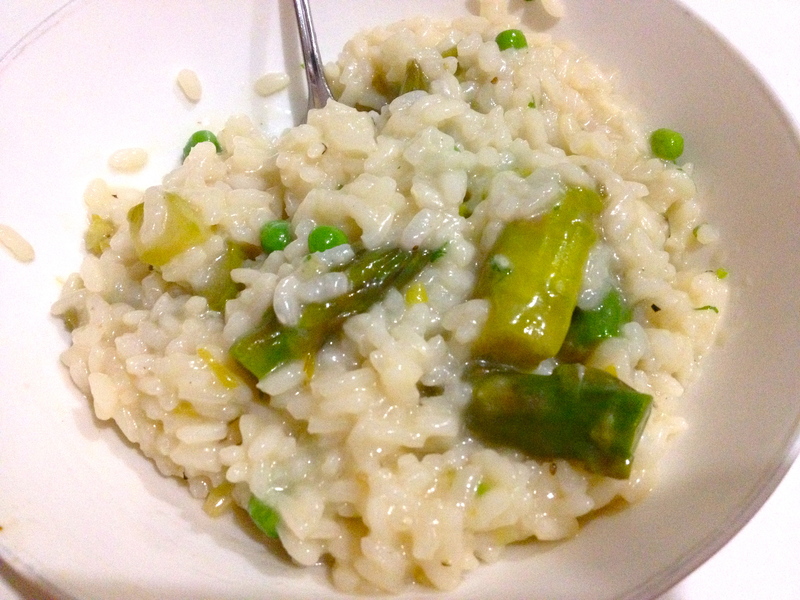 I just think it doesn’t get any better than creamy, cheesey risotto, especially with some perky green vegetables in the mix. That’s why I made it for dinner this week! Risotto has a reputation as a hassle of a homemade dish, but I think that’s rather harsh and undeserved. It’s not that it’s at all difficult to make, it’s just that it takes some effort. In fact, risotto is actually pretty easy, if you can handle a bit of extended stirring in front of the stove. So if you find yourself with a free evening and you’re feeling like cooking up something special, risotto is definitely the perfect dish. Every time I make it, I’m amazed at how beautifully creamy it becomes—why is it so darn good?! Because risotto demands your full attention, make sure to have everything prepped before you start. First, blanche your asparagus in a shallow pan of boiling water until just barely tender but still crisp, about 2 minutes, and then plunge them into an ice bath to stop the cooking process. Chop the asparagus into bite-sized pieces and set aside. In a saucepan, heat stock to a low simmer and continue to simmer it, so that it’s nice and hot when you add it to the risotto. Cold stock will interfere with the rice cooking process because it will need to heat up each time you add it, so this step is important. Now heat a Dutch oven or other large pot over medium to low heat. Oil the pan and add the green onion and a pinch of salt. Cook about 2 minutes, stirring occasionally, and then add the rice. Stir well and cook the rice until the sides are transparent and you see an opaque white spot in the center, about 3-5 minutes. That means it’s time to start adding the liquid! First, pour in the wine and stir until almost all of the liquid is absorbed. 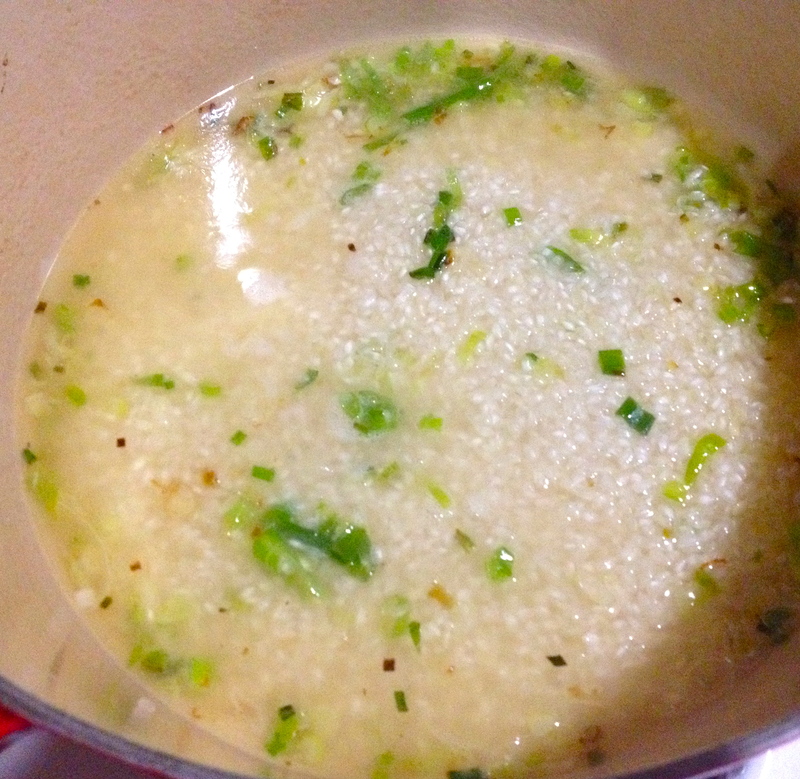 Then, add the first ladle of stock—just enough to submerge all the rice. Stir almost constantly as the rice absorbs the stock. Once nearly all this stock is absorbed, add the next ladle, again just submerging the rice. Repeat this process until you add your final ladle of stock. Once you’ve added the last bit of stock, drop in the asparagus and peas. Then stir until all the stock is absorbed, and remove form heat. The rice should be creamy and tender, with a little bit of a chewy texture. Sprinkle in the Parmesan cheese, parsley, lemon zest, and salt and pepper to taste. Serve with an extra sprinkle of cheese and enjoy the fruits of your foodie labor! 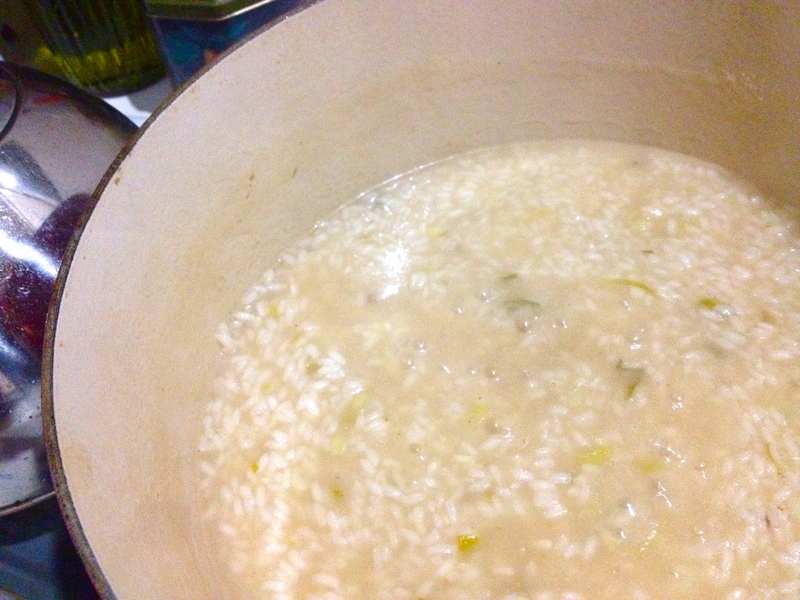 I love making risottos … both for the process and the product! Yummy!!! I love asparagus and can’t wait to try this!